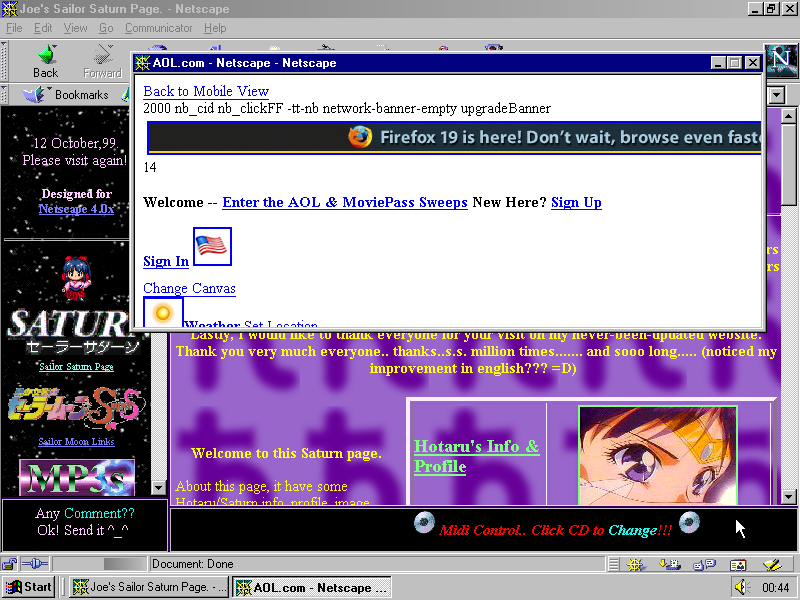 A curious page was just posted on the One Terabyte of Kilobyte Age tumblr. You can’t see, but there is a message behind the annoying AOL pop up window. The author of the site got to know about the Geocities shut down and logged in to say goodbye to those who would visit it by chance or because they are still waiting for an update. BTW, if you wonder why the page that was obviously updated in 2009 appears on the Tumblr now with the last modified date being December 30th 1998: the reason is the HTML frameset. We observed many cases where the frameset was apparently created when the home page was first published, and references files that have been updated years later. Because the file that outlines the structure of the page identifies the page’s age inside the Geocities archive, it is not rare that the home pages were actually last updated much later than they are presented on our Tumblr.